The eternally playful Jeremy Scott — fashion’s most colorful designer – whose ready-to-wear show this season is called “Dolly Pattern” spelled his Fashion Week invitation with kiddie alphabet blocks. The playground appeal danced off the letters of his invitation to the Care Bear-printed mini-skirts of the runway. 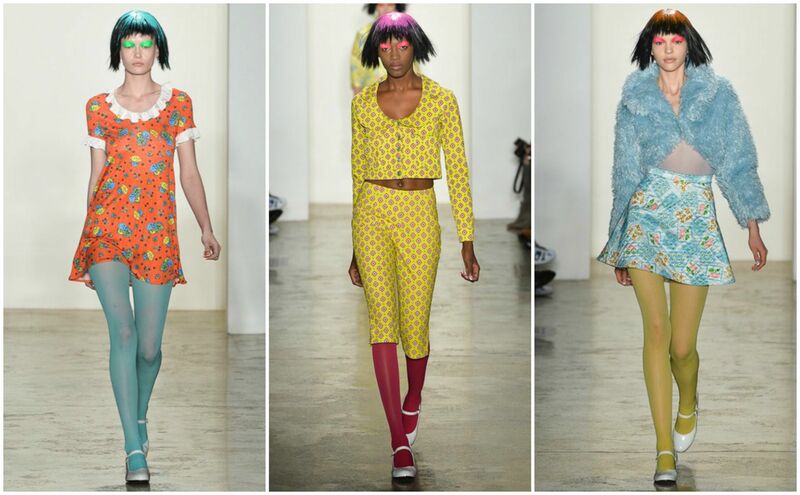 As eccentric as ever, the show featured black blunt bob wigs with a splatter of colorful paint paired with blobs of neon eye make-up, leaving models looking like psychedelic Japanese Lolitas. Prints were brazenly avant garde, trimmed with school girl white ruffles, paired with joyously bright tights and shiny white Mary Janes. If one clicks upon Scott’s website to purchase clothing, they’ll notice the Fear and Loathing in Las Vegas quote “Too weird to live, too rare to die” stamped proudly, embedded beside the moving images of his clothing. From the march of pop stars demanding the Pratt-educated and recently crowned king of Moschino‘s designs (Rihanna‘s denim runway look from the “We Found Love“ video, Katy Perry‘s Super Bowl outfits) to the anticipated kaleidoscopic runway shows, Scott lives up to his rebel reputation. Front row celebrity sightings included Scott’s friend and fan Kanye West, who debuted his own collection with Adidas this fashion week.